Have you ever checked out Stuck?! Challenge Blog? I've used their sketches in the past, but never actually participated in their challenges. Isn't that an amazing sketch? I love how they colored each element to make it pop off the page. It gave me so much inspiration to work with. I kept with the main layout of the sketch and added my own twist. For instance, I used 2 photos instead of 4 and added more embellishment clusters than the original sketch has. The photos are from my third birthday party. Though I don't remember this particular party, I do remember that my mother always made every party feel so special to me. She always ordered a large sheet cake, tons of balloons, pretty party hats, and decorations to match. She sent out invitations and had little goodie bags ready for all the guests. Her party planning skills are something I try to mimic for my son's parties. She really could have ran a successful party planning business. This sketch challenge was also a GDT Call. Check out all the details in THIS POST. Do you remember any of your childhood birthday parties? What made them feel special? 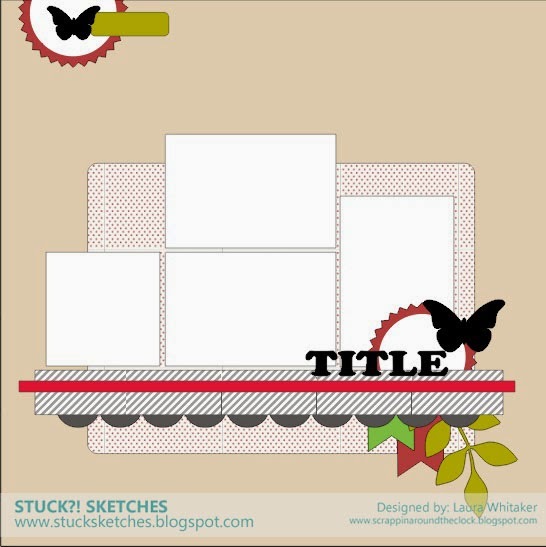 Labels: Challenges, Layouts, Scrapbooking, Sketch, Stuck?! Such a pretty page with fabulous elements, fab stitching too! So glad you linked up with us at Stuck?! Love your background work and all the fabulous embellishing! Thanks for playing along with Stuck?! Thank you for the sweet compliments, Sandy. Fabulous take on the sketch! Thanks for joining us at Stuck?! Love this page! Love that you used older photos!! AWESOME! Thanks for playing along with us over at Stuck?! Sketches!! Thanks Aurelie. I love using older photos of my childhood. It brings back so many forgotten moments. HI Andrea! Can you please email me at iwhitaker@sympatico.ca thanks!